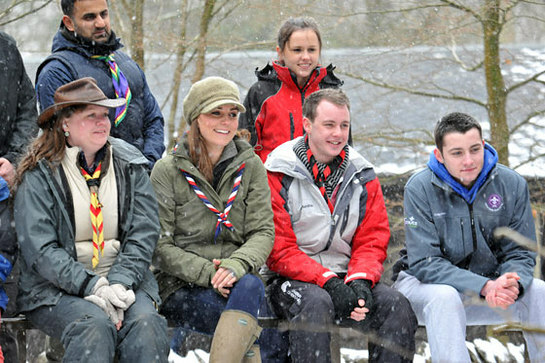 The Duchess of Cambridge showed she was fully prepared when she braved the snowy weather to visit a Scout camp in the Lake District last week. Her Royal Highness, who is a volunteer in the Scout Association, joined fellow adult volunteers as they trained to work with Beaver and Cub Scouts at the Great Tower Scout Camp near Newby Bridge in Cumbria. She used her training to help look after a group of Cub Scouts from Cumbria and Manchester taking part in a pack holiday event at the 250-acre activity centre close to Lake Windermere. As part of their programme, the Cub Scouts got a chance to try outdoor cooking, fire-lighting and tree-climbing under the guidance of The Duchess and the other volunteers. But The Duchess, being five months pregnant, kept her feet firmly on the ground. The Scout Association is hoping the visit by one of the country’s most high-profile figures will encourage other young adults to get involved in Scouting. More adult volunteers are needed for the 35,000 young people currently waiting to join the movement, which already has well over half a million members. The Duchess, who is keen on volunteering, helps out occasionally at a Scout group close to her home in North Wales. UK Chief Scout Bear Grylls said: "The Duchess has an incredibly busy life yet, since she joined the Scouts, she has so generously managed to volunteer some incredible time to help out and get involved with her local group.